Frost, with minimum temperatures of up to -6 C, has been recorded in northwest Alberta and most of the central Prairie provinces. Daily minimum temperatures in the eastern provinces and Manitoba have not sunk below 6 C. Regions around Calgary, Saskatoon and Regina have seen daily minimum temperatures as low as 0 C but this light frost is not expected to be of concern and producers should check on their crops in the afternoon to assess if there’s any damage. 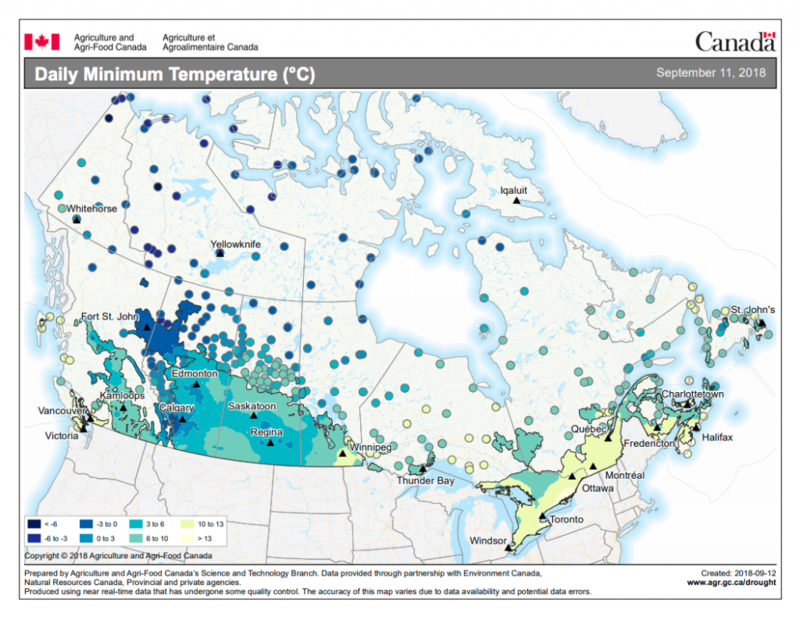 A frost, or daily minimum temperature, map is available through Agriculture and Agri-Food Canada’s website. The Canola Council of Canada has released a quick guide for canola producers who are seeing frosted pod and seeds. Producers are encouraged to wait four to six hours after a morning frost before making a harvest decision. For soybean producers, the impact of frost is influenced by the level of soybean maturity. Longer duration of freezing temperatures, dry soil, wide rows, less nighttime cloud cover are all factors that can increase frost severity, according to Manitoba Pulse and Soybean Growers latest bean report. The report also details frost impact on soybeans depending on the soybean growth stage.